Stamford AFC manager Graham Drury. A buzz of anticipation is building around the town as the Stamford AFC team of 2016 bid to reach the first round proper of the FA Cup for the first time in the club’s history. The Daniels take on higher league AFC Wrexham at the Zeeco Stadium in the fourth qualifying round tomorrow (October 15, 3pm kick-off), as they look to go one step further than 2014 when they were beaten 2-0 by Hednesford at their old Wothorpe Road ground. Stamford AFC striker Ryan Robbins (red). Drury said the overall feeling at the club was ‘excitement’. He said: “We are very positive, we believe we can do it. We are going to go out there and try and win it that is for sure. Wrexham are currently playing in the fifth tier of English football, the lowest level they have played since they were first elected to the Football League back in 1921, but they have reached the FA Cup quarter-finals three times in their history, and famously caused a huge FA Cup upset in 1992 against then English First Division Champions Arsenal, coming back from a goal down to win 2-1. Of course the Red Dragons will be heavy favourites tomorrow, even though they sacked under-fire manager Gary Mills asfter his side’s slide down to 15th in the National League. But Drury said being the underdogs will suit his side in this game. Stamford are only 18th in the Evo-Stik NPL First Division South, but they are unbeaten in their last six games in all competitions. Drury said: “Mistakes can happen when you are under pressure. While Stamford will be underdogs because they play three divisions below Wrexham they have already done some giant killing this season, beating League One leaders Scunthorpe United 3-0 and League Two Grimsby Town, 2-1, in pre-season. Drury said: “We played against a very good Grimsby side and we won. Scunthorpe are flying at the top of League One and we beat them as well with a really good performance. Drury said training has gone well this week as he prepares his side to play in a couple of different formations to combat what Wrexham will throw at them. 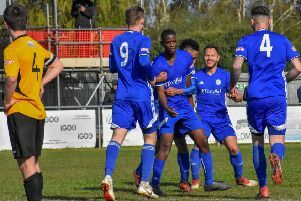 Stamford will be without two of their strikers for the tie as skipper Jordan Smith is banned and new signing Grant Ryan, who scored on his Daniels debut in their 1-0 win over Basford United in the FA Trophy on Saturday, is cup tied. However Drury said he has no shortage of options up front with Elliott Sandy, Ollie Brown-Hill, John King, Ryan Robbins and Jevani Brown to pick from. Drury said he and his team need the people of Stamford to come out in the numbers to create a real atmosphere at the Zeeco Stadium to improve their home advantage. The manager said: “We are calling on the people of Stamford to come out in numbers and show their support. “I want to thank the Peterborough League for postponing some of the local games, Ketton, Stamford Bels and Stamford Lions, so the local football community can come and support us. “974 is the record at the Zeeco and I would love it if we could beat that. To fill it would be amazing and show what an amazing community we are in Stamford. Daniels fans are being advised to arrive earlier than normal to the ground because of the expected increased footfall. It will be pay on the day only for the big match with adult tickets costing £10 with concessions available at £7 and £3. The club will also produce a special souvenir programme. In the United Counties League in-form Premier Division sides Yaxley and Peterborough Sports are both away from home tomorrow. Leaders Sports are seeking a 10th straight win at Kirby Muxloe, while Yaxley are after win number eight in a row at Oadby. Unbeaten Evo Stik Division One South leaders Spalding host Leek Town tomorrow. Fourth Qualifying Round: Stamford v Wrexham. Division One South: Spalding Utd v Leek Town. Premier Division: Cogenhoe United v Deeping Rangers, Holbeach United v Northampton Sileby Rangers, Huntingdon Town v Wellingborough Town, Kirby Muxloe v Peterborough Sports, Oadby Town v Yaxley, Peterborough Northern Star v Northampton ON Chenecks, Wisbech Town v Desborough Town. Division One: Bourne Town v Bugbrooke St Michaels, Long Buckby AFC v Blackstones. Division One: Holland FC v March Town United, Wisbech St Mary v Coggeshall Town.